Weather this week was absolutely amazing as the temperatures were mainly 75 to 85 degrees being a bit to warm for some guests and just perfect for others. The fishing was again Fantastic for Smallmouth Bass and the Northern Pike turned on. Jerry Amer and Bill Calhoon from Columbus, OH were back for the 17th time in as many years. DOA they could not believe the Smallmouth Bass reception they got catching 88 Smallmouth Bass with 8 being trophy fish over 18-inches. 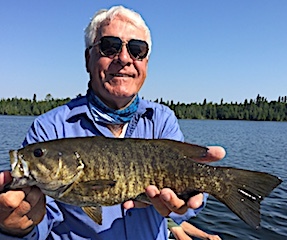 1st full day was just un-real as they caught over 160 Smallmouth Bass, almost all being 14 to 18 inches, plus 23 were Master Anglers Award Trophy Smallmouth Bass measuring 18-20-inches. They caught a lot on surface poppers however the Ned Rig was the best producer of the day. 2nd day plan was search for Muskie at Closs Lake and they were very successful locating fish, having 50 follows of all sizes including some monsters, but no takers and for a few hours before calling it a day they fished Smallmouth Bass on Little Vermilion Lake catching 23 on surface poppers fly-fishing. 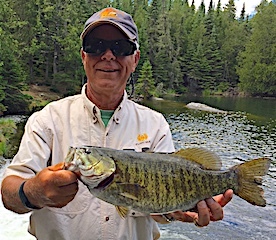 3rd day was fabulous catching 80 fish combining their Smallmouth Bass and Pike with Bill being the top Bass fisher landing many BIG Smallmouth, including several trophy fish. 4th and final day they finished with 50+Smallmouth, several nice Pike and 1 Muskie, with 5 of the Smallmouth Bass being trophy fish over 18-inches and Bill got the big fish of the trip landing a Monster 20.5-inch Smallmouth. This year Jerry will be back in 2 days after dropping Bill off at the Winnipeg airport. He will be picking up his wife Lindy and returning for her 1st Canadian Wilderness Fishing Experience. Both left astounded by the great fishing, the best ever for Smallmouth Bass, and another set of wonderful memories between best friends. Best Friends Don Landbo and Dan Skolza from S Elgin and Sugar Grove, IL returned for the 17th straight year. 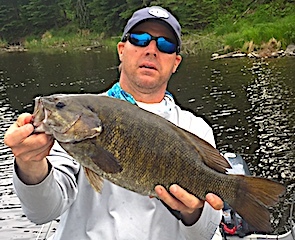 DOA Targeted Smallmouth Bass catching 30 matched his personal best landing a 20.5-inch Trophy setting the bar for the next 6 days. 1st full day of fishing had them catching 74 Smallmouth Bass a loads of Big fish including 8 Trophy fish 18 to 18.5-inches. 2nd day was there traditional trek to Hooch Lake catching 114 Pike on Buzz Baits plus 16 Smallmouth Bass 4 trophies with 3 over 19-inches. 3rd day they caught 158 Northern Pike plus a few Smallmouth do landing a Trophy at 18.5-inches. 4th day ended up to be their best Northern Pike day ever catching 199 mostly on buzz baits. 5th day while targeting Smallmouth they caught 47 Smallmouth Bass and 11 were trophy Size fish measuring between 18 to 19.5 inches. They also had a few very large Muskie follows but could not get them to take any of their offerings. 6th and final day they got back to Northern Pike fishing landing 103 plus 6 more BIG Smallmouth Bass 4 being trophy size and three were 19-19.25-inches. After taking their traditional picture in front of my tackle shop we chatted for almost and hour reminiscing about some of the years gone by. Both left having an amazing fishing trip making some great memories between two very good friends. Thanks for choosing Fireside Lodge for your special fishing vacation time. Father and son Jack and Steven Starnes from Wise and Duffield, VA made it 17 of 17 years fishing at Fireside Lodge. 1st day was amazing as they caught near 100 Smallmouth Bass all 14-18-inches, with at dozen Trophy Smallmouth Bass 18-20-inches, most on Poppers, plus hooked 3 Muskie and laded 2 with the 3rd breaking off Steven’s Pop-R. They said the fish were very concentrated & did not have to move much all day to accomplish these great totals. 2nd day had them on the Smallmouth again catching 85-90, 12 Northern, Pike and several Muskie. 3rd day they Muskie fished all day catching five 30 to 35-iches and a few nice Northern Pike in the 35 to 38-inch range. 4th day was back at Muskie fishing landing 3 and getting many follows. 5th day was fabulous catching about 80 Smallmouth Bass and 30 Northern Pike with 2 Muskie. 6th and final day had them catching 40 + Smallmouth Bass & about 20 Pike to finish off another very memorable fishing adventure. They ended the trip making their reservations for the same dates in 2019. Father & Son Paul and Tony Capecchi From Inver Grove Hgts and Woodbury, MN consecutive year guests since Tony was 16 years old now 35 returned for the 3rd year in a row with Tony’s wife Joanna and 3 year old Joe. 1st day they had a blast with Joe catching the first fish on his first cast of the day. Joe ended up catching some Northern Pike and 2 Smallmouth Bass both being a Master Anglers Award Trophy fish measuring 18.5 and 19-inches. This was a great fishing feat from a 3-year old. 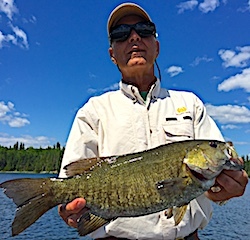 Jody also caught a Trophy Smallmouth Bass at 18-inches and all caught close to 100 Northern Pike. 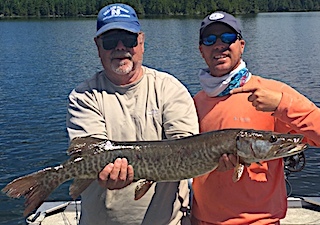 2nd day Paul and Tony had their traditional portage to chase Closs Lake Muskie having a great day catching 5 Muskie in the 30-35-inch range with many follows and several BIG Northern Pike, Paul with a 38-inch and Tony landed a 40-inch Trophy Northern Pike. 3rd day was full of fast action Northern Pike as the Pike just kept coming, with Jody having the hot hand keeping the others busy netting her fish. 4th day was almost a repeat of the 3rd all catching a lot of Northern Pike, Jody again having a great day and Joe got a couple of nice naps boating from one area to the next. 5th & final day was chasing Muskie for Paul & Tony from early morning until 10:30AM having some success. The rest of the day was spent having family fun on the water and soaking up their last moments just enjoying the wilderness surroundings. Before departure Paul made reservations for the foursome again in 2019. 3rd time return Group headed by Bob Miles Freeman, MO with Stuart & Jason Storrs Overland Park, KS & Tallahassee, FL - Ed Ruddy Kansas City, MO - Ted Hollo Aurora, OH – James Bartling KS George Bartling Lynn Haven, FL – Kris Gamble Olathe, KS and Jim Hover from Overland Park, KS were at Fireside Lodge to enjoy their traditional fishing trip. 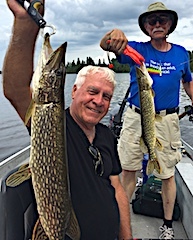 The trio of Jim & George with Ed had a fantastic day catching 150+ Northern Pike, another boat caught well over 100, and the third boat said they caught so many they just could not keep count. All said the fish were good size. 2nd day was a traditional group shore lunch day all meeting at Twin Falls to chow down on Walleye with all the fix n’s. Jim & George B with Ed, not doing to well on Pike, but switched to Smallmouth & they did well. 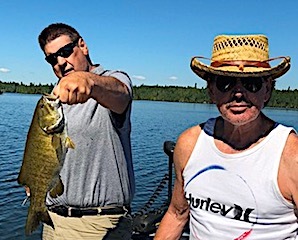 3rd day Jim, George, & Ed caught 75+ Smallmouth Bass on the true blue Beatle Spin, while Chris, Ted, & Bob chased Pike and Stu, Jason and Jim H caught a lot of Smallmouth several Pike, & Stu caught a nice Muskie on a worm fishing for Bass. Also Kris and Jim B both caught 19-inch Trophy Smallmouth Bass and Jason caught a Trophy measuring 18.5 inches. 4th day was terrific fishing and catching as each boat caught between 60 to 80 Northern Pike plus they got pictures of a Moose swimming across the lake. For some on the 5th and final day BIG Muskie or Northern Pike was their goal & others were just out to catch fish. 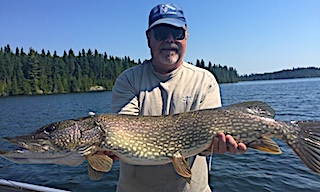 Some nice Northern Pike in the mid to upper 30-inch range were caught a others did catch numbers and all in all everyone went home enjoying their stay with us at Fireside Lodge and making memories among family and friends. Thanks for choosing Fireside for your special fishing trip. First time guests Chester Bojanowski from Ocean Isle Beach, NC, with good friends Frank Laurent & Daryl Anderson from Menomonee & Oconomowoc, WI were happy to be here prompted by Chet reading my weekly fishing reports for years. First two days had them learning the lake a catching some Northern Pike and Smallmouth, 3rd day was their break out day as they caught near 65 Northern Pike and their smiles at the supper table told the whole story. 4th and final day they toped the day before catching 70 Northern Pike and losing at least 30-40 fish. This is fishing action none have ever experienced before and all said the last two days were the best fishing they ever had in their lives. Lloyd Morton, a guest since 1994 from North Lawrence, OH returned with Grandson Cole from Dallas, TX for their 5th consecutive year together. 1st day before supper the caught some good bass having a total of 30+ and picked up another 8 after supper making for a great day. 2nd day was fabulous catching Northern Pike and 30+ Really BIG Smallmouth Bass 17 to 19-inches. Third day had them catching almost a dozen Pike all being over 30-inches and 40+ Smallmouth with 10 measuring Trophy size between 18 to 19 inches. 4th day they caught 14 nice Northern Pike but had at least 50 pike follows, which drove them crazy, but at least they were fishing the right spots. 5th day they caught 27 Smallmouth Bass 15 to 17.5 inches with about as many smaller bass plus some Northern Pike up to 36-inches. 6th day was a good day catching plenty of Pike but fishing time was cut short from heavy rain and winds. 7th and final day they did really well getting into a bunch of Northern Pike over 30-inches with several 35-36-inches. Both had a blast as usual catching up, kidding and telling stories between themselves and with guests they have gotten to know well over the years. What a GREAT way for a Grandfather and Grandson to spend time and make life long memories together. Thanks for choosing Fireside Lodge as your destination to spend special time together. 7th time return guests Jim & Richard Pim, good Friend Steve Howlett from Shell Knob and Carthage, MO were back with Richard’s son Doug & with his young boys Logan, Tyler, and Brody for their first ever Canadian Wilderness Fishing Experience. DOA Richard & Logan did well with Logan catching a 15-inch Smallmouth on his 1st cast, both catching a total of 23 Smallmouth, Richard landing 2 over 18 and Logan caught his first Trophy measuring a huge 19+inches. Doug, Tyler, and, Brody all caught fish with Brody catching his 1st 18-inch+ Trophy and his first Northern Pike just over 30-inches, while Tyler caught a nice 15-incher and had two big trophy Smallmouth on, losing them both right at the boat. Jim and Steve also caught a lot of Smallmouth Bass using the Ned Rig. 1st day Rich & Logan caught 35+ Smallmouth up to a 19.25-inch Trophy by Logan, Doug, Tyler & Brody did well catching a lot of Northern Pike & also caught some Smallmouth Bass. 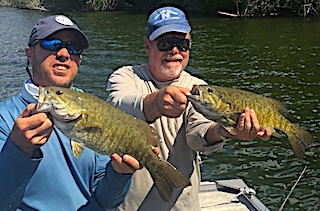 Steve & Jim also did will catching a lot of Smallmouth but also had seen many big Smallmouth Bass swimming in groups and at times just following and looking at their lure with curiosity, and then just swim away. 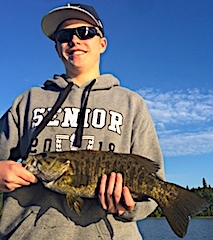 2nd day was super for Smallmouth Bass fishing as each boat caught 50 to 65 Smallmouth Bass and Logan came up with the BIG fish of the day landing a 44-inch Trophy Northern Pike on a Yo-Zuri. This fish had a massive girth estimating weight at 26 to 27 pounds. 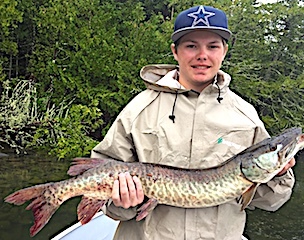 3rd day it was Tyler who hooked & landed a Monster Trophy Northern Pike measuring 42-inches just busting out at the seams. So by their 3rd day all three boys had caught a Master Anglers Award Trophy Smallmouth Bass in the 19+ Range and two caught Trophy Northern Pike. At breakfast of their 4th and final day Brody said it was his turn for big pike and he did catching BIG 33-inch Northern Pike along with all catching a lot of Smallmouth Bass. All left with many family memories that will last a lifetime. Back for their 3rd time in 4 years were brothers three Terry, Larry, and Bill Woodhams respectively from Blackhawk, CA Pasadena, FL and Whitehall, MI. 1st day these 3 had an absolute ball catching both Northern Pike & Smallmouth Bass with one just missing the Master Anglers Award Trophy qualification of 18-inches. 2nd day they did well again on both Northern Pike and Smallmouth Bass with Bill landing the first Trophy Smallmouth of the group at 18.5-inches. 3rd day was unreal as these three caught 130+ Northern Pike. Bill said there were at least 9 or 10 times they all had a fish on at the same time. 4th day was a good day with Bill doing the best catching the most Smallmouth Bass including his second Trophy Smallmouth measuring 18.5-inches plus he caught the biggest Northern Pike of the day measuring 35-inches. 5th and final day ended with a fabulous day catching 65 to 70 Northern Pike before 3PM when they tried to beat the T-Storm chasing them. They got very wet but that will just add to the many memories they made fishing together. Thanks for choosing Fireside Lodge for your yearly fishing trip. Don Bizzaro from Boston, MA returned for his 3rd trip, this time with his 13-year old grandson Joey. 1st day they had a great day, despite T-Storms bring them back at 2PM, catching 26 Northern Pike and Joe was very excited as he was describing a Muskie following his lure right to the boat. 2nd day had them catching some fish but mostly trying to stay dry as we had heavy rain with very windy conditions. Day three they made up for lost time having a fabulous day they will remember for the rest of their lives catching 53 Northern Pike with plenty of other action. 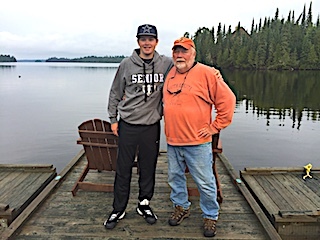 Both went home catching a boatload of fish and making special memoires between Grandfather and Grandson.